The need for man to be friendly to the environment has again been stressed. Making this call was Professor Olusegun Odukoya, a Professor of Analytical Chemistry from the College of Natural Sciences, when he delivered the 43rd Inaugural Lecture of the University. Professor Odukoya’s lecture, which was titled, Pollution-Free Environment: A Mirage or an Attainable Reality? , solicited for proper care of the environment so that the environment would in turn, take care of man. The don, an alumnus of the University of Ibadan, noted that the abuse of chlorofluorocarbons, bromoflorocarbons and other Ozone-depleting chemicals, which are still being used in Nigeria for air conditioners and refrigerators, a practice which he said should now be discouraged. According him, the depletion of the Ozone layer, can lead to a number of serious health issues like skin cancer, cataract of the eye with children being more vulnerable and remarkable reduction in the levels of plankton in the oceans, causing the death of several animals. The Inaugural Lecturer highlighted the main forms of environmental pollutants to include organic, inorganic and metal pollutants. According to him, the organic pollutants result from the uncontrolled use of pesticides, fungicides and herbicides, which are gaseous emissions that pollute the atmosphere. The Professor of Analytical Chemistry, however, made far-reaching recommendations that could assist in militating against the pollution of the environment, which include the channeling of acid-producing gaseous emissions into lime water, collection of effluents into concrete holding tanks through treatment with water hyacinth and drastic control of the massive emission of carbon dioxide into the atmosphere, to avoid global warming. “With all the toxicological problems caused to the human body by metal pollutants, it becomes appropriate to identify the sources of these pollutants and the quantity each source introduces into the various segments of the environment. This is with a view to reducing the amount of pollution from each source and if possible, prevent the introduction”, he stated. 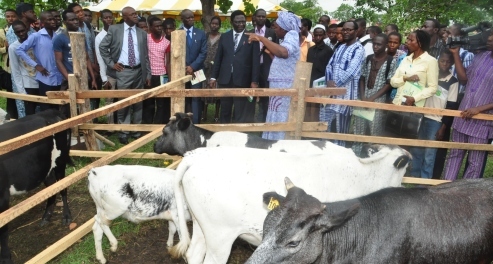 Professor Odukoya said he chose the topic of his lecture, based on the fact that every Nigerian is a stakeholder in environmental matters, which would invariably contribute largely to the state of health of the people through his research contributions in the area of minimizing environmental pollution. Professor Olusegun Odukoya is a member of learned societies such as the Science Association of Nigeria and Chemical Society of Nigeria and had produced seven Doctorate degree graduates, many Master’s degree graduates and had supervised research projects for several First degree graduates. 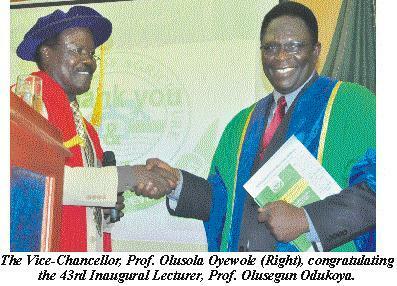 The Vice-Chancellor of FUNAAB, Professor Olusola Oyewole, who chaired the occasion, stated that the lecture was the fourth from the Department of Chemistry, seventh from COLNAS and also the seventh to be presided over by him as Vice-Chancellor.